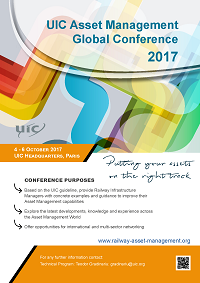 "Putting your assets on the right track"
The Asset Management Working Group of the International Union of Railways (UIC) is organizing its third international Conference dedicated to Asset management, in Paris at UIC Headquarters, from the 4th – 6th of October 2017. 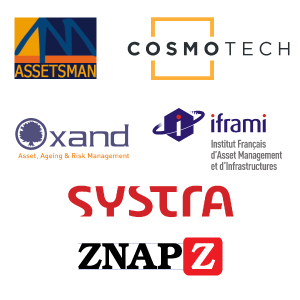 This Conference is opened to the whole Asset Management world and will present the latest developments in various industries (roads, waterways, energy…) and on different continents. Our recently issued UIC Railway Application Guide “Practical implementation of Asset Management through ISO 55001” will be the backbone of this Conference and will underlie its program. Offer opportunities for international and multi-sector networking. UIC is pleased to invite you and your representatives to attend this conference. Looking forward to meet you there.